I’m legit in love with this combination as is Sonam Kapoor, with this dark onion pink top and teal green saree. Rustic but inspired, isn’t it? Whatever the fabric, it’s the shades that matter, so experiment with different kinds of material - silk, crepe, chiffon… Each of which will lend a unique touch to your look. Not my absolute favourites as separates, this colour match surprised me as much as it did you. Yes, yellow and grey is a thing. No, scratch that it’s a GREAT thing. Exhibit A, Esha Gupta’s stunning kurti-garara ensemble, balanced perfectly between ‘pop’ and ‘elegance’. Give this shade pairing a shot the next time you step out for a festive desi night, and your look will deliver like a star. Yes, I’m serious. When it comes to Indian wear, I’ve seldom seen or done monochrome. Think about it. I mean, I wear the classic black and white combination like everyday. But it’s all western - I know desi style is essentially festive, but it is graceful and sophisticated too. And that’s where Shilpa Shetty’s look comes in. This belted black and white saree is EVERYTHING and beyond. Adding one to my cart right now. BRB. Probably the least preferred colour combination for western wear, the black and brown pairing is underrated. Especially when it comes to desi style - Taapsee kills it in a half-draped brown saree over a sheer black blouse. The brown oxford shoes are another win. What’s not to love? An international hit on runaway and also high street fashion, this pretty pairing is the work of a colour cupid. It’s a fine line, so be careful not to pick shades that clash. 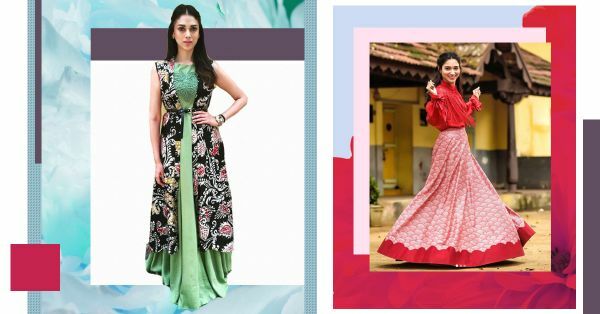 For instance, Tamanna Bhatia’s Victorian style blouse and printed pink skirt = perfect addition to your Indian wardrobe, isn’t it? Admit it, you need this in your desi wardrobe. Now. I don’t blame you, the colour combination of mint green with black is stunning and so is Aditi Rao Hydari. Take a cue from the actress and layer it up with a fun print for props. You’re welcome.